I think Chris Chelios was the best ever American-born player in the NHL. 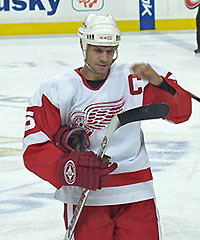 Chelios grew up in Chicago, Illinois and played 2 years for the University of Wisconsin–Madison before joining the Montreal Canadiens. He played 26 years. He was a 3-time Norris Trophy winner as best defenceman. He won a Stanley Cup with Montreal, got to the finals when he moved to the Chicago Blackhawks and won 2 more Stanley Cups after being traded to the Red Wings (1999-2009). He played for the U. S. in the Olympic Games 4 times and was captain in 1998 and 2006. You can nominate your choice for best ever American in the NHL on the Hockeytown Online Forum. The best ever European player in the NHL has to be Nicklas Lindstrom. He has won the James Norris Memorial Trophy seven times as the NHL's best defenceman, and has been voted into eleven NHL All-Star Games. With the Red Wings, Lidstrom has won four Stanley Cups and is the first European-born and trained NHL captain to win the Stanley Cup, as well as the first European player named playoff MVP. Representing Sweden, Lidstrom won the World Championship in 1991. At the 2006 Winter Olympics, Lidstrom was a major factor in Sweden's win over Finland in the finals, scoring the gold medal clinching goal. The Sporting News and Sports Illustrated selected Lidstrom as the "NHL Player of the Decade". Nicklas Lidstrom has played his entire NHL career with the Red Wings. This will be his 20th season and he has been captain since 2006. History of the Red Wings from joining the NHL as the Detroit Cougars in 1926 to the present. The Toledo Walleye are dually affiliated with the Detroit Red Wings and Chicago Blackhawks of the NHL, and the Grand Rapids Griffins and Rockford IceHogs of the AHL. They are members of the North Division of the Eastern Conference of the ECHL. The Grand Rapids Griffins play in Grand Rapids, Michigan at the Van Andel Arena. They are the American Hockey League affiliate to the Detroit Red Wings of the NHL. Goaltender for the Red Wings, he was runner up as the NHL's rookie of the year in 2010.